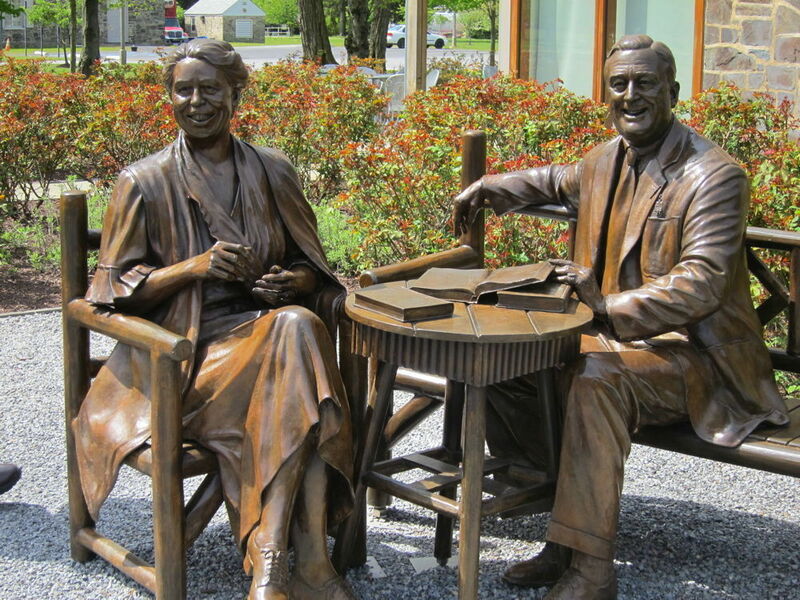 Meet The Roosevelts at Hyde Park makes all of Dutchess County an interesting place for a family visit. Tea at Hyde Park, New York. Roosevelt Ride makes it easy to get around. A 90-minute train ride from Grand Central Station brings you to history-rich Hyde Park, New York, one of the National Park Service monuments celebrating 100 years of service. This is where Franklin and Eleanor Roosevelt lived, and a visit here is a great way to get the entire family thinking about the American presidency. Why not make it a Roosevelt Weekend and begin the learning in New York City? New York City has some Roosevelt sites well worth a visit, either before or after your trip to Hyde Park. The interesting mid-19th century Theodore Roosevelt Birthplace at 28 East 20th Street is the home of the 26th president, who was Franklin’s fifth cousin and uncle to Eleanor. National Park Service rangers offer tours daily, and the fully restored home is a great place to introduce kids to early 20th century life, and how a childhood full of family travels made Roosevelt one of our greatest explorers. His 23-room Victorian summer white house, Sagamore Hill in Oyster Bay (about a 30-minute drive), houses dozens of hunting trophies from his expeditions in the wild. New York boasts another Roosevelt House, much less known, at 47-49 East 65th Street, which now belongs to Hunter College. Franklin, Eleanor, and their five children shared the two-family home with Sara Delano Roosevelt, who would become the “First Mother” in the White House. Although the home no longer has original furniture, some of the large rooms display Roosevelt memorabilia and historic photos. A visit to either property and some time reviewing Ken Burns’ documentary, “The Roosevelts” should prepare everyone for the next adventure. We know even very young children enjoy a scenic day in the country. Hyde Park is a wonderful destination that provides kids with lots of running space, miles of hiking trails, glorious gardens and picnic-perfect opportunities. And, you can get there from New York City by public transportation. The National Park Service runs a free daily shuttle, providing transportation to the areas historic sites. Your day begins at Grand Central Station, where you catch the Metro-North Hudson Line’s early train to the last stop, Poughkeepsie. The clean and comfortable Roosevelt Ride shuttle meets the train at the station. The shuttle bus brings you to the F.D.R. Presidential Library and Museum on the grounds of what was his beloved home, to Eleanor’s rustic home Val-Kill, and to the palatial Vanderbilt Mansion. These historic sites have initiated some innovative programs that cater to families. At FDR’s home, F.D.R. Presidential Library and Museum, costumed interpreters add an interactive, theatrical flair. As you enter this grand home, expect to be formally greeted by the butler. Saunter upstairs to the family’s bedrooms, and Johnny, the gruff James Cagney-like Secret Service agent, will engage you with some juicy tidbits about life with the Roosevelt’s. At the Gilded Age Vanderbilt Mansion, experience the lifestyle of the super rich from the servant’s point of view. The ‘At Your Service’ tour assigns each visitor a role as a member of the household staff. You might be a cook, laundress, or footman. If you and your family are fans of the popular BBC series ‘Downton Abbey’, this tour is tailor-made for you. 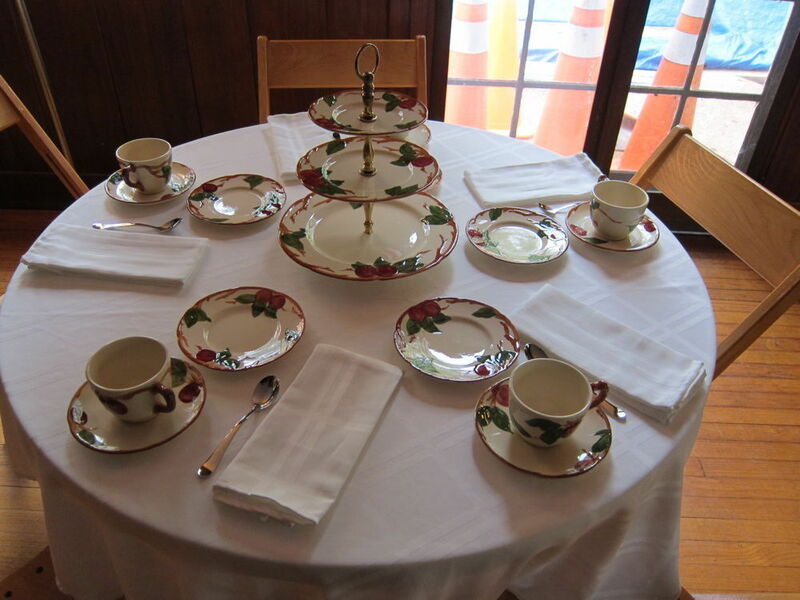 At Val-Kill, the Eleanor Roosevelt estate, teatime discussion groups known as ‘Cottage Conversations’ are on the menu. These casual, one-hour chats focus on various aspects of the life of Eleanor Roosevelt, over tea and cookies. If you are lucky enough to visit Val-Kill on a Monday or Friday, your guide will be Doris Mack. Mrs. Mack was a personal friend of Mrs. Roosevelt and she happily shares her love and enthusiasm for her friend with interested visitors. We learned a lot from our day in Hyde Park. We were stunned that Eleanor’s beloved home Val-Kill was so utterly low-key and non-pretentious, giving us insight into Eleanor’s character. Visiting FDR’s home and library was thought-provoking. What prompted a man who was born into such extreme privilege to champion the common man and create the foundations of our current Social Security system? Was it his battle with polio, was he influenced by his sensitive and intelligent wife, or was he simply born caring about those less fortunate? The Roosevelt Ride gets you Back to the City Quick! We were able to discuss these ideas on our train ride home. The shuttle brings you back to the train station in Poughkeepsie at 5:00pm, in time to catch one of several trains to Grand Central Station. The Roosevelt Ride is free and admission to all of the historic sites is moderate; free for kids 15 and under. There is no extra charge for the special tours and tea, but they are not offered every day, so call ahead. Do check on Metro-North’s bargain-priced family fare; last season, up to four children ages 5-11 paid just one dollar with a fare-paying adult. 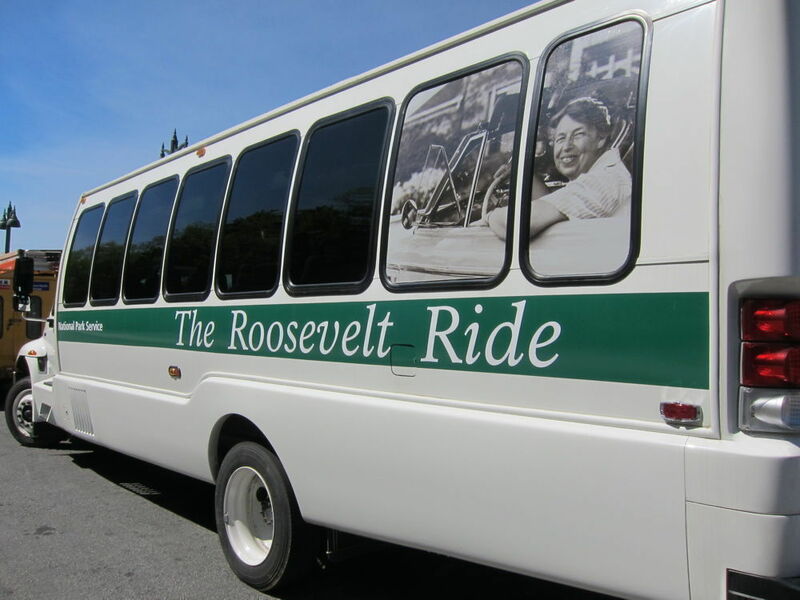 The Roosevelt Ride runs daily from May 1 through October 31, and reservations are appreciated by calling (845/229-5320). For more information on these historic sites and other things to do with kids in the region, go to Dutchess County New York Getaways. Consider taking a later train back to NYC and dining in Poughkeepsie, a blossoming foodie hotspot. This small city is undergoing urban renewal while still retaining some of its elemental grit. For dinner with a view, try the Ice House on the Hudson. You’ll dine riverside, in the shadows of the Walkway Over the Hudson, the 1.28-mile pedestrian bridge. The Mill House Brewing Company is another delicious option. Adults can sip the house-brewed craft beer while the entire family can enjoy the homemade sausage, wood fired pizza and juicy burgers. The Roosevelt Ride only runs through October, but the first two weeks of November is when you can score an epicurean bargain during Hudson Valley Restaurant Week. Foodie families may want to drive the Taconic State Parkway and indulge, as dozens of local eateries present delectable menus at discounted price. Products from Hudson Valley farms are featured, so everything is unbeatabley fresh.